I love a challenge! If you have ever bought a bag of mixed yarn bits off eBay or Craigslist, found a box of intriguing yarn in a relative's attic, or been handed a sack of random yarn as a gift, you will have eventually found yourself faced with the question of identifying it. What IS this stuff, and what can I do with it? Snip off a few inches and pluck at it: how many plies does it have? Does it have a "halo" of longer, finer fibers that haze off of it? What kind of texture does it have - is it smooth and shiny like an artificial fiber, or rough and grippy like a classic Shetland wool? Is it a novelty yarn with odd bits of texture, or a thick-and-thin sort of yarn that might have been hand-spun? 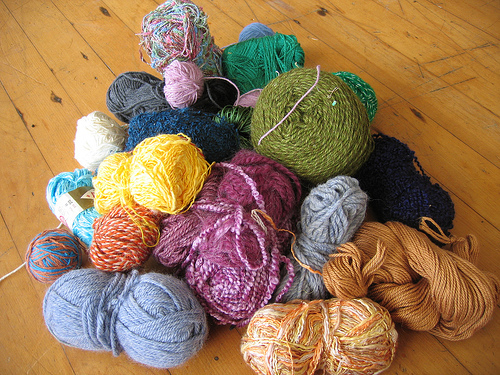 Is the yarn in a hank, a skein, a center-pull ball, or was it hand-wound into a cake or ball? Take notes, and get photographs of the yarn, both in the skein and as individual strands. These can help forum users identify it for you. The next step is to perform a burn test. Do this in your kitchen sink, or outside in a barbecue grill, with a glass of water handy. Set the yarn on a plate you don't care about or a square of tinfoil, and hold a flame to it. What happens when you do this? Does it easily catch fire, does it melt, or does it only reluctantly catch fire and then extinguish itself when you move the flame away? What does it smell like when it burns? Burnt hair, burning paper, melted plastic, or something else? Does it leave any ash behind? There are several burn test charts you can find online. Here is an excellent and detailed flow chart that lists how the fiber burns, what it smells like, and what the ash looks like to help you diagnose what sort of fiber it may be. Once you have your burn test results and your identifying information, the Yarn forum on Ravelry is a great resource! Ravelry forum users will probably be able to identify the specific make and model of your yarn within a few hours, given a good set of photographs and the results of a burn test. Why do animators always get knitting wrong?